Water hammer. Reverse Flow. Pump Backspin. Any number of conditions can cause expensive damage to pumps and piping systems. DeZURIK has been in the business of providing solutions to your pump system regulation needs for more than 75 years. 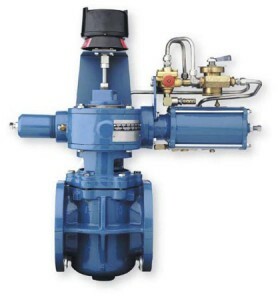 We can provide custom-designed and engineered systems for those precise flow regulation problems, or the powered Pump Check Valve that offers significant advantages over a gravity or spring-operated valve. Typical applications of powered Pump Check Valve systems are municipal installations with long runs, hills or anywhere there are major changes in elevation. Pump Check Valves are also ideally suited for industrial process systems such as the primary cooling towers in the power generation industry.